I’ve been trying to replicate this traditional black bean soup since I returned to North Carolina from Oaxaca last week. I’ve made three batches and eaten them all. Perfect for vegetarians. If you are not a vegetarian, you can enrich the soup with leftover chicken or pork, sliced or cubed. Some people say Oaxaca’s best is La Biznaga‘s La Negra, a cream of black bean soup with queso fresco, avocado chunks, and pasillo chiles topped with crunchy fried tortilla strips. Lots of great restaurants have their own version on the menu. You be the judge. Here is my version … Norma’s adaptation of La Negra! Add the black beans to the water and bring to a boil. Pour into a colander and drain liquid completely and rinse thoroughly. Rinse your pot and return the rinsed beans to the pot, adding 3-4 cups of water or enough to cover plus one inch. Crumble the dried pasillo chiles into the beans. Road the fresh ancho chiles and the bell peppers on a comal or over a gas burner until the skin puckers and begins to blacken. Remove the chiles and let cool. Peel the skin under your faucet. Slice into strips and add to the beans. Roast the garlic on a comal with skin on. When the garlic is soft, remove and peel skin. Add to the beans. Bring bean and pepper mixture to a simmer and continue to cook until the beans are soft and have absorbed all the water. Test for doneness. Add more water and continue cooking if needed. Pour entire mixture into a blender and puree for about 3 minutes or until all the beans and peppers are pulverized. Test for soup consistency. If too thick, add water. Return to pot and reheat. Taste for spiciness. If you want more heat, you can add more dried pasillo chiles or toss in a few drops of Mexico’s famous hot sauce, Valentina. Note: You can make this same recipe using pinto beans and red beans. You can get most of these ingredients at some of the larger U.S. chain grocery stores. I like to shop at my local Mexican market. The pasillo chiles are dried and packaged or in a bin. I find the best avocados at the Mexican markets, too. Always ripe and ready to eat! Years ago I owned a gourmet cookware shop and cooking school called Clay Kitchen in South Bend, Indiana (long before the Internet). I taught cooking classes and made up recipes as I went along. I still love to do this, so this is one way I get to share my other passions with you — cooking and eating! This entry was posted in Food & Recipes, Oaxaca Mexico art and culture, Travel & Tourism and tagged black bean soup, blogsherpa, food, Mexico, Oaxaca, recipes. Bookmark the permalink. I need to make this! Sounds great….but can i find these chiles here or did you bring them back?! Your recipe makes me believe that Oaxaca lives on in you in N.C.
Great idea to put the beans, etc into a blender. 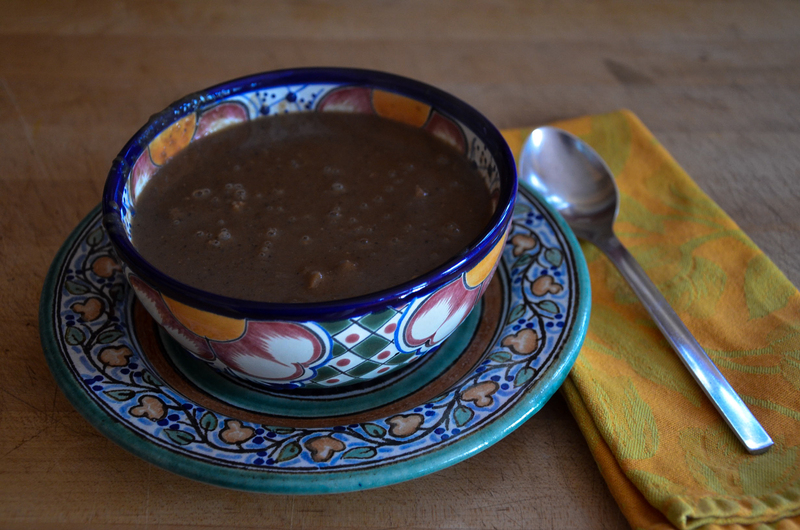 My black bean soup always has Mexican oregano, cumin and epazote – said to help in the digestion of beans. And, something probably out of the ordinary – cardamom – which adds an interesting dimension. Sometimes, fresh chopped cilantro on top. Martine, great suggestions. I hope people try your version with the oregano, cumin and epazote. Maybe we can get dried epazote here, too! In my first batch I added about 2 T. of dried, crumbled avocado leaf (hoja de aguacate) which adds a slight anise favor — probably a bit like your cardamom! Wonderful how we can experiment and adapt to each of our own tastes while keeping Oaxaca in our minds and stomachs! Looks yummy! I checked your site for a salsa recipe but didn’t see one. I bet you could come up with a great one! Ah, salsa. Do you really think I can improve on Paul Newman’s Mango Chile Salsa?